Brain accumulation of the amyloid-β (Aβ) peptide is believed to be the initial event in the Alzheimer disease (AD) process. Aβ accumulation begins 15–20 years before clinical symptoms occur, mainly owing to defective brain clearance of the peptide. Over the past 20 years, we have seen intensive efforts to decrease the levels of Aβ monomers, oligomers, aggregates and plaques using compounds that decrease production, antagonize aggregation or increase brain clearance of Aβ. Unfortunately, these approaches have failed to show clinical benefit in large clinical trials involving patients with mild to moderate AD. Clinical trials in patients at earlier stages of the disease are ongoing, but the initial results have not been clinically impressive. Efforts are now being directed against Aβ oligomers, the most neurotoxic molecular species, and monoclonal antibodies directed against these oligomers are producing encouraging results. However, Aβ oligomers are in equilibrium with both monomeric and aggregated species; thus, previous drugs that efficiently removed monomeric Aβ or Aβ plaques should have produced clinical benefits. 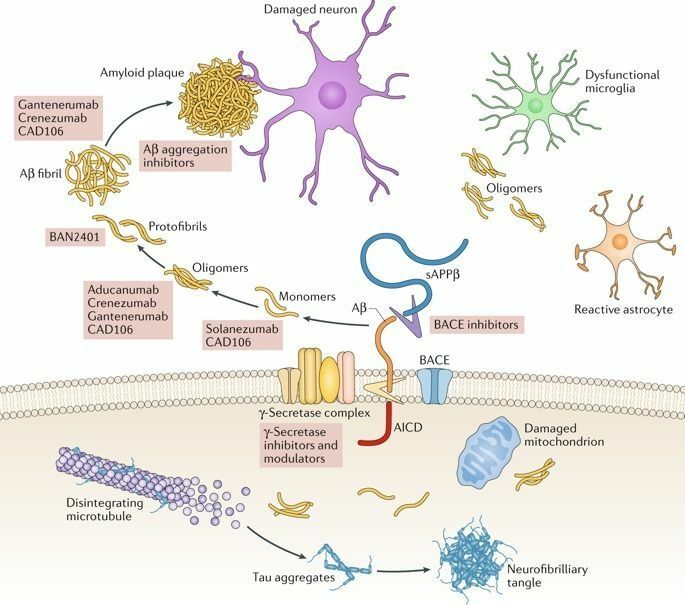 In patients with sporadic AD, Aβ accumulation could be a reactive compensatory response to neuronal damage of unknown cause, and alternative strategies, including interference with modifiable risk factors, might be needed to defeat this devastating disease.